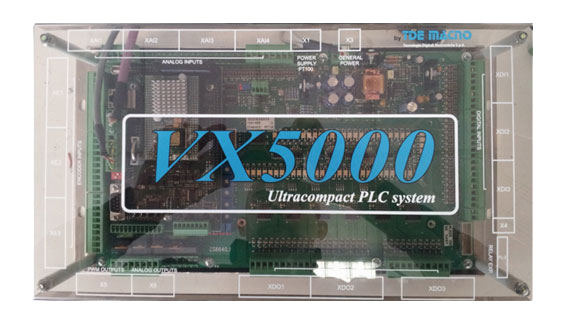 VX5000 is the latest generation of controllers particularly indicated to the plastic working machines (Injection molding, Blow molding, Extruders, Plastic film, Flexographic machines) based on an Embedded architecture. A compact and customizable I/O system allows the implementation of a complete logic control for dedicated and effective solutions. The development environment, based on a multi-user and multi-thread Linux operative system, with real time kernel RTAI extension modules, allows a user-friendly and optimized programming accordingly to the IEC 61131-3 standards. VX5000 allows the interface via Ethernet or RS 485 to every interface device (PC or HMI) and to any other devices as well, according to the most common market standards. Is available also in panel configuration with 10” and 15”LCD.